This Gold Coast theme park is the perfect place to spend the day with family or friends. Dreamworld spans over 30 hectares and is filled with a variety of rides, shows and attractions. Dreamworld is home to 9 Thrill Rides including the Tower of Terror - the world's tallest and fastest thrill ride, the Giant Drop - freefall from 38 storeys or 'The Claw' - 9 storey adrenalin rush! Enjoy Wiggles World, The Australian Wildlife Experience, Tiger Island, V8 Supercars Redine, Zombie Evilution - combat zone Alien vs Predator vs YOU and Flow Rider - surfing, skateboarding and bodyboarding! Make contact with marine life wonders like dolphins, seals, penguins, sharks and polar bears at Australia's SEA WORLD. Visit the amazing Shark Bay where you can come face-to-face with the most feared species of sharks in the world! Check out the new Sea Jellies Illuminated and learn all about these marine creatures in an interactive exhibit. Visit Polar Bear Shores, watch the Jet Stunt Extreme show, visit Cartoon Network Cartoon Beach, enjoy the rides and attractions at Sesame Street Beach. Experience the magic and excitement of a world where EVERYONE'S A STAR - Warner Bros. Movie World! Experience rides like no other with the DC Rivals HyperCoaster offering 1.4 kilometres of thrills or barrel rolls and inverted dip of the Green Lantern Coaster! There is family fun for everyone as when you step inside the 4D Roxy Theatre or take a trip down to the Looney Tunes Village. Whatever your adventure Warner Bros. Movie World is waiting for and ready for you! 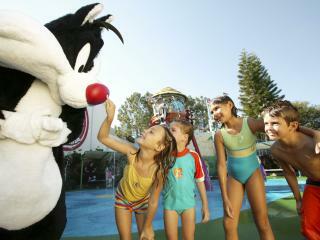 This Gold Coast Theme Park is a fantastic place to have fun and enjoy the beautiful sunshine. Wet 'n' Wild Water World is easily accessed off the highway, not far from the Gold Coast. There are numerous rides to choose from that cater for all ages, do as much or as little as you like. This Gold Coast theme park is set directly adjacent to Dreamworld. WhiteWater World by Dreamworld is perfect for a day out with family or friends. Enjoy spending time in the water while on thrilling rides and attractions that are suitable for all ages. 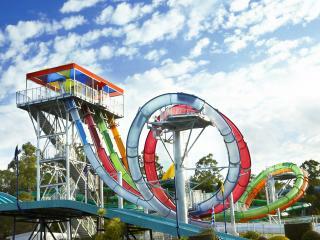 WhiteWater World is a must do while visiting the Gold Coast or Brisbane.